Teams of digital design specialists and frontline healthcare professionals are competing for a cash award to invest in a new technology product which will improve patient care. The Design Challenge, organised through the Connected Healthcare Programme, will culminate in a final ‘hackathon’ day at Barnsley Digital Media Centre (DMC) later this month. The most promising idea presented at this event will be awarded a £5,000 Innovation Voucher from The University of Sheffield’s Centre for Assistive Technology and Connected Healthcare (CATCH). Other rewards will be presented to the Design Challenge teams and it is hoped that many of the innovations conceived during the process ‘which may include mobile apps and telehealth software – will be taken forward and turned into finished digital products which will improve healthcare delivery. Connected Healthcare project manager Ceri Batchelder said: “The Digital Health Design Challenge has been all about encouraging genuine collaboration between design specialists, healthcare providers and representatives from academic and commercial organisations committed to supporting innovation in healthcare. “We’ve had a fantastic response to the initiative and there has been a real buzz in the room as people have brought their experience and expertise to the table to ‘co-create’ technological solutions to real-life health service challenges. The NHS trusts involved include Barnsley Hospital NHS Foundation Trust, Doncaster and Bassetlaw Hospitals NHS Foundation Trust and Sheffield Teaching Hospitals NHS Foundation Trust. Their design challenges have been drawn from areas of patient care such as maternity, dementia, prevention of pressure ulcers, wayfinding in hospitals and managing long-term conditions. Service improvement officer at Barnsley Hospital NHS Foundation Trust John Crossland said: “This has been a really exciting experience for the clinicians involved. They’ve found it refreshing to be part of the creative process right from the start ‘usually they get presented with a finished product and asked ‘does this work for you’ but it can be much too late to make amendments once it’s already been developed. The Connected Healthcare programme has been initiated and organised by the DMC, through Barnsley Council’s Enterprising Barnsley business support programme, in partnership with the Yorkshire & Humber Academic Health Science Network (AHSN) and Tech North. The final day of the Yorkshire and Humber Digital Health Design Challenge will take place at the DMC on Wednesday April 20th, when participants will present their projects and judges will present prizes including the CATCH innovation voucher. 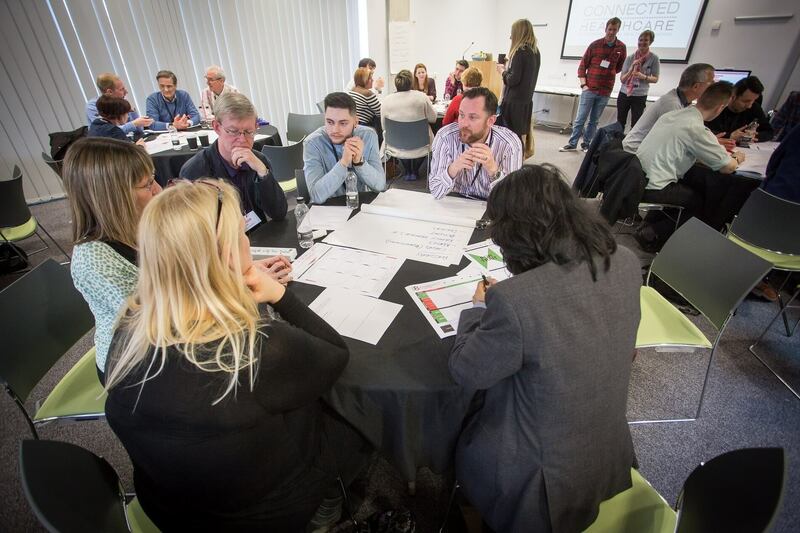 Attached photograph shows teams at work at the first Yorkshire and Humber Digital Health Design Challenge event at the Barnsley Digital Media Centre last month. Other photos available.